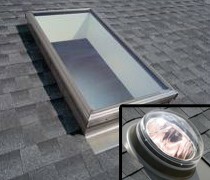 Skylights can provide interior living spaces with the warmth and brightness of natural daylight. Their ability to enhance almost any interior has made them increasingly popular; as well, skylights can provide ventilation and roof access. Ventilating a building through an opening skylight releases hot air that naturally accumulates near the ceiling. Sun tunnels are the perfect solution for hallways and small spaces that natural light does not easily reach, with a highly reflective tunnel that brings an abundance of natural light into any home or commercial environment and where traditional skylights are not an option.